Walking is a great low-impact exercise that’s low cost and high reward. All your senior loved one needs is a good-fitting pair of walking shoes and comfortable clothes to get started. Encourage your loved one to get moving with these five health benefits of walking regularly. Approximately 33 percent of Canadian seniors over the age of 65 have arthritis. Though it may seem counterintuitive, one of the best ways for seniors to reduce their arthritis pain is to move. Low-impact exercises such as walking can reduce arthritis pain by strengthening muscles, lubricating the joints, and rebuilding the tissue in the knee joints. 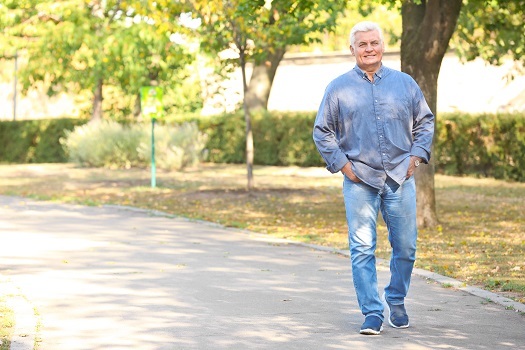 Even if seniors have mobility issues or health conditions that make walking a challenge, they can still get the benefits of exercise, especially with the help of a trained professional caregiver. Winnipeg elderly home care professionals can be a wonderful boon to seniors. Whether they require around-the-clock supervision or just need assistance with exercise and household tasks a few days a week, seniors can enjoy a higher quality of life with the help of trusted in-home caregivers. Walking can help your loved one build lean muscles and lose excess weight. Losing weight benefits the joints by reducing the amount of pressure on them. According to Diabetes Canada, losing weight helps seniors manage their diabetes and prevents new cases from occurring. Just a 15-minute walk can burn 70 calories. Encourage your loved one to go on several 15-minute walks throughout the day for the best results. No one likes getting sick, but getting a cold or flu can be especially harmful to seniors. Many seniors have weakened immune systems from other health conditions or medications. Walking can strengthen your loved one’s immune system and keep him or her from getting sick. Walking between 30 and 45 minutes a day has been found to increase the number of immune cells in the body. These cells fight bacteria and viruses that enter the body and prevent them from causing illness to occur. If you usually help your loved one exercise but need a break now and then, consider having a professional caregiver take over for you. Winnipeg respite care professionals can assist seniors with a wide array of daily tasks, offering family caregivers the chance to focus on other personal responsibilities or take a break to prevent burnout. Whether it’s for a few hours a day or a few days a week, respite care is the perfect solution for family caregivers who are feeling overwhelmed. One of the most important benefits of beginning a walking routine is the effects it has on cardiovascular health. The heart is a muscle that needs regular conditioning just like the other muscles in the body. Walking increases the heart rate and strengthens the heart. When the heart is stronger, it pumps blood more efficiently, which reduces blood pressure levels. Additionally, regular walking can lower cholesterol levels and prevent heart disease from occurring. For the best results, your loved one should combine walking with a heart-healthy diet that’s high in whole grains, lean proteins, fruits, vegetables, and healthy fats. Losing memories is a concern many seniors around the world share. Walking can reduce memory loss associated with dementia and Alzheimer’s disease. Research presented at an annual Alzheimer’s conference in Vancouver, BC, showed that walking three times a week prevented brain shrinkage. Additionally, walking has also been found to be an early predictor of the disease. Slower walking speed may be an early sign of dementia, and getting treatment early may lead to a better prognosis. Seniors who need assistance with walking or performing other exercises safely can benefit from the help of a trained professional caregiver. Winnipeg senior care experts are available to provide high-quality care to seniors on an as-needed basis. From assistance with mobility and exercise to providing transportation to the doctor’s office and social events, there are a variety of ways professional caregivers can help your aging loved one continue to live independently. Call Home Care Assistance at (204) 489 6000 today to talk to one of our compassionate Care Managers about our high-quality home care services. Should Aging Adults Avoid Milk?